There was the boat he built as a kid, along with his Sailfish. Later came a Typhoon, three classic MacKenzie bass boats, a few Aquasports, a Mako and five Egg Harbors, the biggest 40 feet. 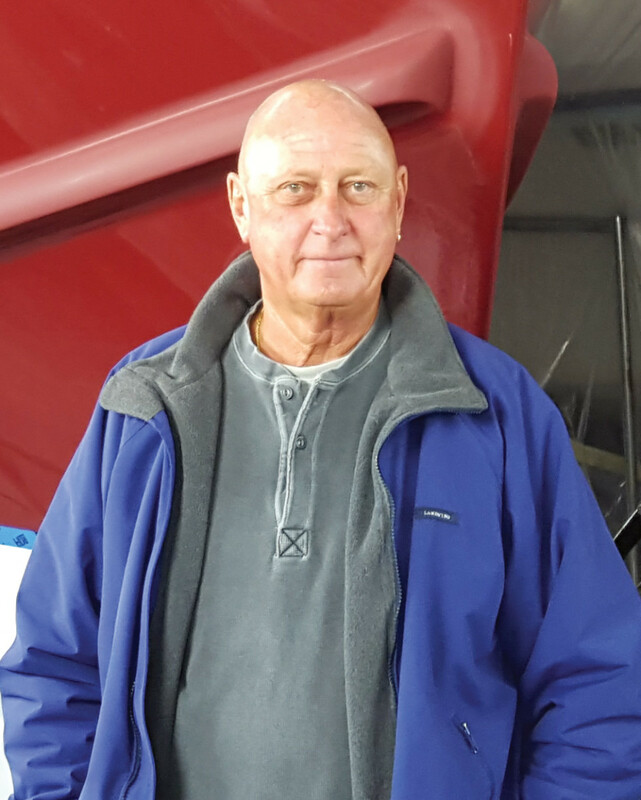 “Ten boats in the last 10 years,” says Anastos, a property manager and former builder who lives in Scituate, Massachusetts, with his wife, Donna. No. 49 may just stop the streak. Two seasons ago, Anastos got his hands on a 1983 Fortier 33, and he’s not about to let go anytime soon. 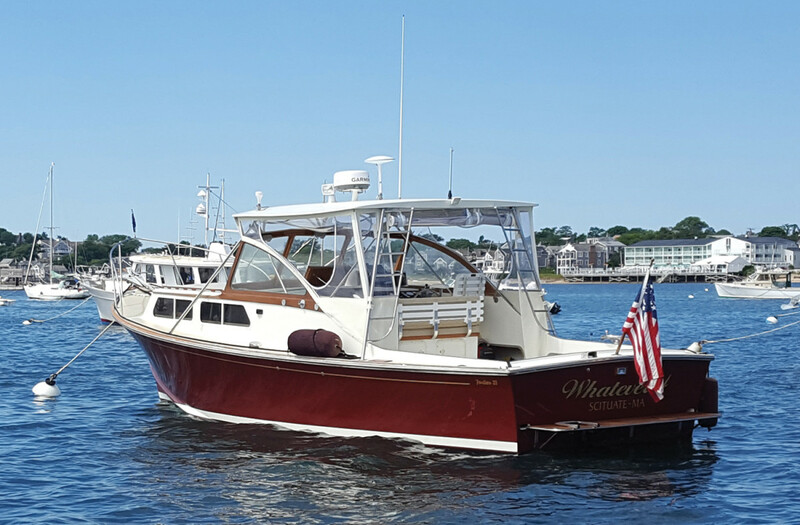 The single-engine, single-stateroom, Massachusetts-built cruiser has proved just the right boat to feed his lifelong passion for being on the water. The Eldredge-McInnis pedigree helped. “I grew up with them. 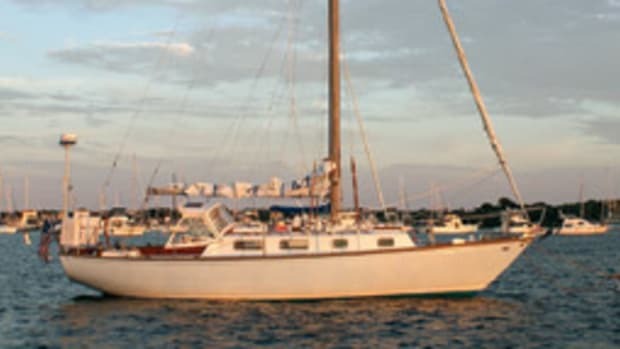 I used to follow them, and I knew the boats they designed and that they’d done the Fortier.” The price was $15,500, and Anastos estimates he’s put almost twice that into refurbishing it, on deck and below. 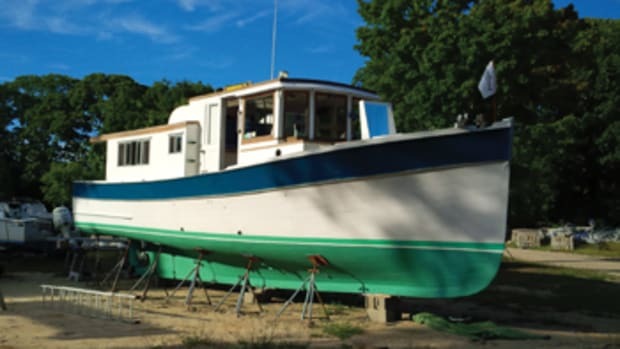 Among the fixes: The hardtop was removed and every inch of the boat painted.The bottom was stripped, the canvas replaced, and new cushions made for the V-berth. A new head was installed, along with a new hot water heater. 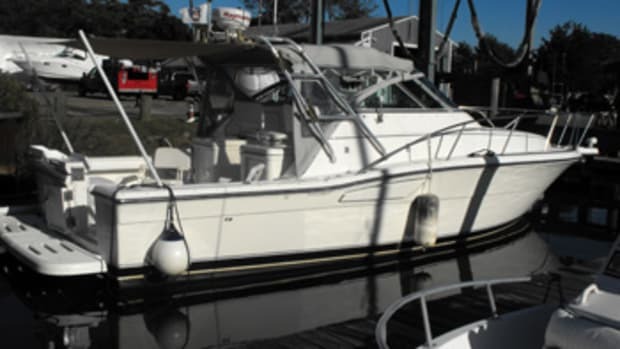 The steering was serviced, the wiring redone, the trim tabs and the prop upgraded. A wooden swim platform and cockpit seating were added for comfort. Anastos took on as many tasks as he could. “I like to do the work on it, and I enjoy planning what we do to it,” he says. To complete the project, he worked with East Coast Fiberglass in nearby Marshfield, Massachusetts. “Jeff [Perette] had done a paint job for someone I knew, and it was gorgeous,” Anastos says. 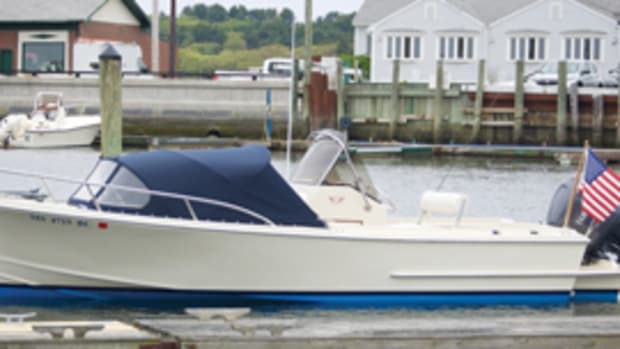 “He and his crew did a terrific job on my boat.” Ken Grondell at Atlantic Coast Canvas Products in Scituate did the canvas work. Power comes from a Caterpillar 3208 turbo diesel with around 10,000 hours on the clock. 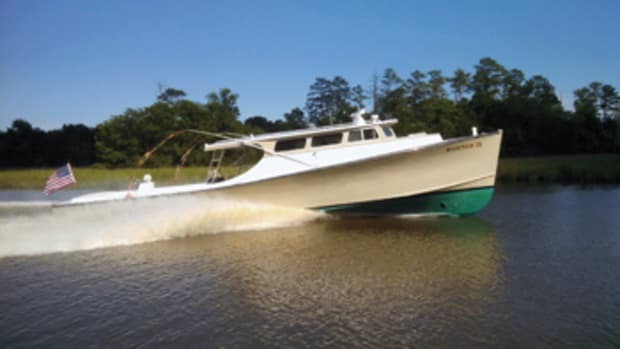 It speeds the 12,000-pound Fortier at a top end of around 24 knots, running at 2,800 rpm. Cruising speed is 17 to 18 knots. 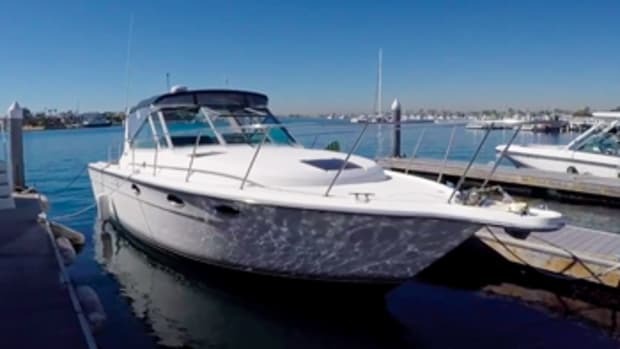 The current Fortier 33 rides a modified-vee hull cored with Core-Cell foam, making it lightweight and delivering a quiet ride. 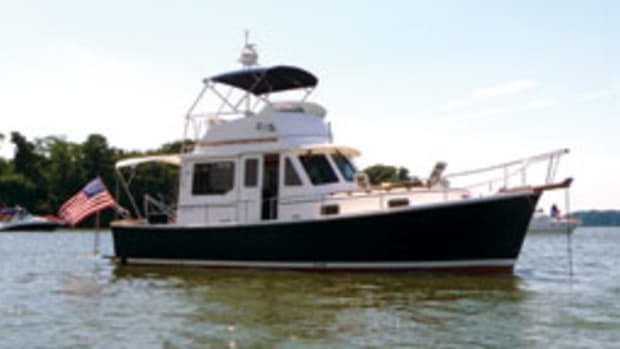 Designed by Eldredge-McInnis, the look is traditional, with its trunk cabin, oval ports and distinctive Fortier windshield. (Older models have big, long portholes.) The bridge deck, with the helm to starboard, complements the open cockpit. There’s a pedestal seat behind a large molded console for electronics, protected by a triple-panel windshield trimmed in teak. The two-person bench seat to port has ample stowage underneath. A transom seat adds a “picnic boat” touch to the layout. Cabin layouts are semicustom. The basic arrangement below has a V-berth/stateroom (enclosed in some models) with shelves, stowage, a teak-and-holly sole and opening ports for ventilation. Amidships is a dinette/settee to starboard that converts to an extra berth. The galley is to port, with a double sink (with hot and cold pressure water), a two-burner butane stove and an under-counter refrigerator. The head compartment, also on the port side, has a shower. 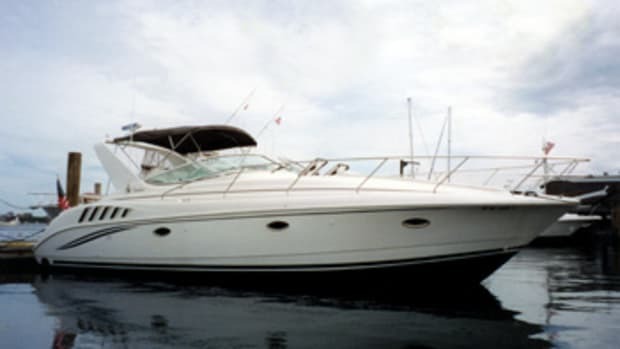 Options include a radar arch, cockpit boarding ladder, hardtop with side curtains and, for the galley, a two-burner electric stove.